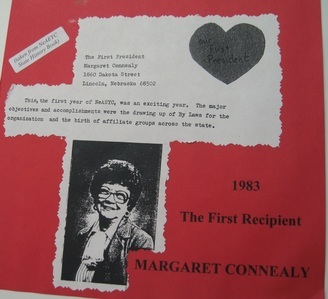 March 1983 – An honorary membership award was developed for a Nebraska AEYC member(s) who has/have contributed outstanding service to the organization, its program of work, its development and/or its membership, or a Nebraskan who has done exemplary work to promote the rights, services, status and programs for/of children. Potential recipients may be nominated by any Nebraska AEYC member. Selection shall be made by the Nebraska AEYC State Executive Committee or an ad hoc committee appointed by the State Executive Committee.